May 20, 2018 | 18:59 1 Do you remember where you were when the news got out about the bse case? Our family was heading home from the lawyer after my brother and I finished signing the papers to buy the neighbors land. 20 years old with only cows to my name and $500k of debt was tough. Almost done paying it off now and I believe it made us better managers though I never want to go through that again. Some memories as I bounce across the field in the cultivator. May 20, 2018 | 20:15 3 Had a few skinny years but made it through. I have thought last couple years guys have short memories. Paying too much for breds and pasture. Usually some suprise to come along. May 21, 2018 | 06:40 4 Yes I was wondering if anyone else would remember the day that changed the life of many people . Yes I was wondering if anyone else would remember the day that changed the life of many people . So true. I used to think of cows before this day as an asset but now consider them a liability that costs money every day they’re here and only figure an asset value on them after they are sold. Still like having them around at least. May 21, 2018 | 22:38 6 Yes....standing around waiting for fertilizer at the plant and a friend told me the news....didn't realize how devastating it was going to be. Had just gotten going in the purebred game....first year I was going to sell open heifers. After that day, bull sales skidded to a stop for awhile....got phone calls to see what was in the cull pen. Thing is, prices now are quite near what they were just before BSE.....but everything else has gone up considerably. But, as Corb Lund says...."Life is better when you have some cows around." May 22, 2018 | 03:40 7 We were planning on changing things up a bit right then. We had just sold the last of the old herd of cows that morning and taken delivery of a load of heifers for breeding and selling as bred heifers. Got the news while unloading those heifers but didn't know how bad it was going to be. Ended up finishing and selling the plainest end of them as butchers and bred/calved 50 of them out -the market for bred heifers was done for a while. Yet in a way it worked out better than it might have because we at least had a herd of young (but pricey) cows going into that mess. But it's exactly as perfecho said - while the prices are fairly strong, everything else has gone up drastically - land, fuel, inputs, equipment. May 22, 2018 | 07:38 8 Can't say I remember that day but I know I didn't sleep much the following night. I do remember where I was in 1996 when the major crap hit the fan in the UK BSE crisis after it had been causing lesser complications since 1989. Looking back the Canadian version was easier to manage through but more costly. The British one was way more difficult to manage but the compensation generally was better. May 22, 2018 | 19:46 9 I was seeding. Dried out previous year. 2003 crop was scant. Kept all the calves over. Big mistake cause market imploded feb 04 when we sold. We lost big time. Never forgot how things can go to hell so easy. I was seeding. Dried out previous year. 2003 crop was scant. Kept all the calves over. Big mistake cause market imploded feb 04 when we sold. We lost big time. Never forgot how things can go to hell so easy. Yep, that was the biggest mistake we made too - keeping calves over and selling in Feb 04. Didn't matter what weight they were they all came out to about $500! May 22, 2018 | 21:47 11 I remember the gut wrenching uncertainty. We were lucky. Sold 2002 calves in early May that year. Had 3/8" of rain in 2002 which seemed like a curse, but it meant we had no old/poor/questionable/open cows left in 2003. We never sold a cow for almost 3 years after BSE. Bought a few cows in November of 2003. Sold the last one 2 years ago. We never played the set aside program, and we marketed based on the newscast of the week for almost 2 years. (Good news around sale time, book the calves in. If it was still good news, deliver and sell. If the news changed, keep em home). May 23, 2018 | 21:13 12 Had sold 1/4 of cowherd in 2002 for good money, sold yearlings and cull cows for really good money a month earlier, sold a 2 year old breeding bull for good money the day before. We were sitting much better than others when the news came. So we coasted through the rest of 2003 without much issue. 2004 and 2005 were the really lean years. By 2006 prices had ticked up a fair bit and we had a backload of culls to sell, so income stabilized a bit. Jun 1, 2018 | 17:54 13 I was working at the vet clinic. We found out first. Called my husband who was at the auction mart just as the news hit there. He said it was amazing. The sale stopped with a calf in the ring. Everyone packed up and walked out to go call back trucks that were on their way to the border. The unsold cattle were sent back to their farms. Within minutes the place was empty. Surreal. Then we had to figure out how to get out from under the 130 suddenly expensive feeders we'd just brought in, as well as the new truck we just took delivery of. We got out from under the calves in February of the next year, and somehow managed to pay for the truck, which we still drive. Agriville became a lifeline. This was where the action was. It all turned us into a bunch of activists. We learned how to scrap directly with RCALF. We made friends all over the country. Right burnt? We survived though. Came out a much tougher bunch. On our farm it made us better managers too. We quickly developed a no second chance policy on the cows. In the long run we've ended up with a better more trouble free herd. Hopefully it's good enough to finance a retirement under our own terms. Jun 9, 2018 | 10:17 14 I honestly don't remember where I was, likely at work though. We had just recently expanded to over 300 cows. And were enduring the 2nd ( and worst ) year of record drought. I would just add to the comments about prices being back to pre BSE levels but costs having ballooned. The same is roughly true for grain, but efficiencies and productivity of crops has increased substantially in grain. 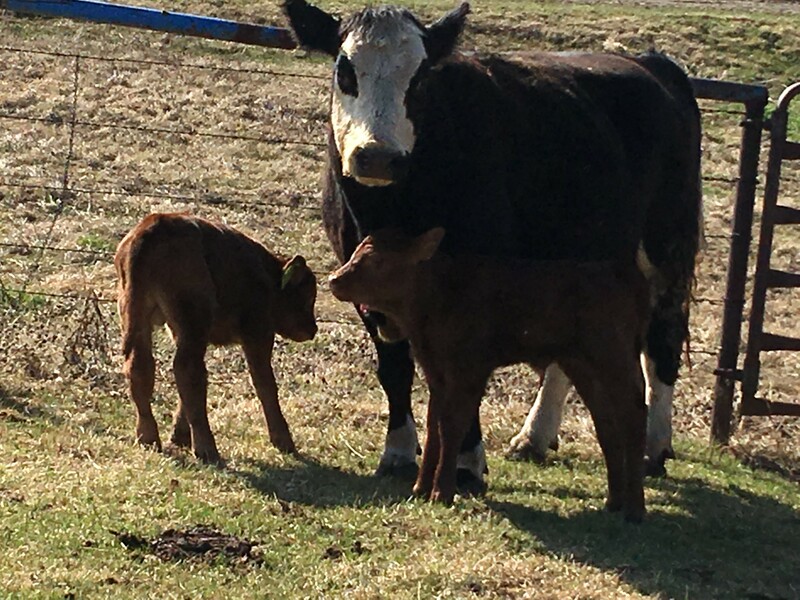 A cow still only produces one calf per year( at best), still eats just as much, still a limit to how many cows one cowman can effectively manage and calve out. There were many places to gain incremental efficiencies along the way, but nothing as drastic as No-till, herbicide tolerant crops, technology and big equipment have been to the grain side of the operation. I honestly don't remember where I was, likely at work though. We had just recently expanded to over 300 cows. And were enduring the 2nd ( and worst ) year of record drought. That is true about grain but what type of efficiency are we referring to? The one where you use all the new things equipment inputs etc? They all are way out to lunch on price. We are producing more off an acre but the cost per acre is too high meaning more acres needed to pay for the new technology etc and if you have a wipe out a couple years say good bye. I think the difference is the scalability that technology has given grain production. There is a big difference between an old 30' hoe drill and even a used 40' air drill. Adding another quarter section means a few hours on the drill and (weather dependent) a few more on a combine. A quarter of Canola at 30 bu and $10 generates $48000. That same cash flow would take at least 50 cows. If you add a 1/2 that is $96000. A bit of marketing and agronomics (and luck) and that could be $150,000 plus. It is not hard to see how that does not favour the cow guy. There are not a lot of folks with the skill set to add 150 cows without adding additional labour and for sure not in a couple of days a year. Jun 11, 2018 | 23:17 17 I know the cattle situation has and is tough my folks did that and I have to say I don't miss those days at all other than I do have found memories of working with my folks and handling the stock. A quarter of grain land is costing what anywhere 250 to 400,000? Payments on that are what 30,000 to 40,000 a year? Spread out the equipment over all the land and what would that be? Quite variable. Doing it yourself or if farming more labor costs? See what I mean? Now take those costs and have 2 years of wipeouts? That 48,000 doesn't give you much of anything on that 30 bushel year. I know the cattle situation has and is tough my folks did that and I have to say I don't miss those days at all other than I do have found memories of working with my folks and handling the stock. That's the tough part of grain farming. Around here, cattle ground is just as pricy but the cash flow is less. It is hard to say if equipment is driving the grain farm, or the grain farm is driving the equipment. $1,000,000 worth of equipment is peanuts nowadays, so that same equipment has to cover more acres to get the cost down. If we add rent/interest costs that are increasing, then the equipment cost has to be driven lower still or cash flow has to increase... Not sure where the cycle ends.